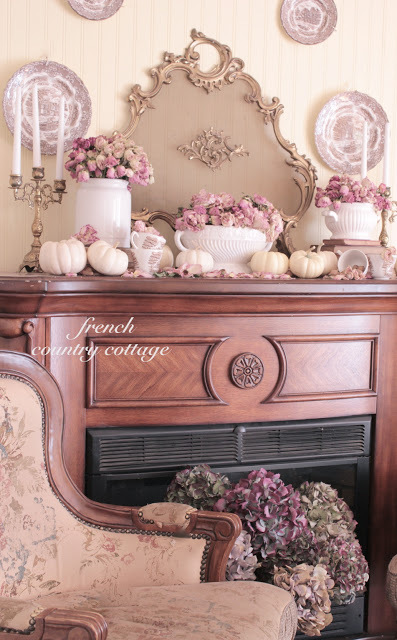 My name is Courtney and I write the blog French Country Cottage. I am so thrilled to be over at one of my favorite blogs today sharing my favorite room! Thank you for asking me to be part of such a fantastic series, Kim! but I would have to say that the one that first comes to mind is my bedroom. Our house is an old 1940’s vacation cottage in the woods. It came with with knotty pine walls, hardwood floors and a lot of work. After about 6 years of renovating and fixing up the original house- we decided it was time to add a master bedroom. We designed the bedroom to blend with the rest of the house as much as possible. Similarly dark stained hardwood floors, beaded board walls and corner windows helped make it feel like it had been here the whole time. In fact, most people who come to our house think it is an original part of it. One of my favorite features in this room is the peaked beamed ceiling. That was a lot of fun to put in... okay not fun really. It was a lot of work but it was worth it. We added beaded board and faux beams over the sheetrock to give it that rustic feeling and make it feel older. Another thing that I love about this room is that it has a ton of natural light. The four corner windows and a set of french doors leading out to the patio bring an abundance of light and sunshine. 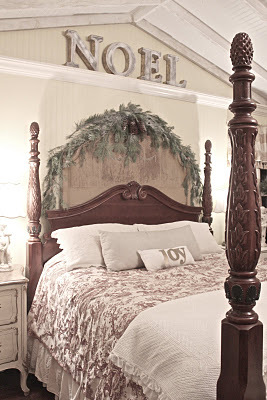 Decorating for the Holidays is a favorite thing to do and the bedroom gets decked as well. The mantel is one area that gets touched almost every season. This year, I dressed it for Autumn with vintage whites and dried roses. and for Christmas last year with fresh greens and candlesticks. I haven't finished the decorating in here yet this year. I love this french commode. Originally it was in my living room but I moved it into my bedroom to serve as a nightstand. The red checked settee is one of my all- time favorite finds. It was a craigslist find several years back and it was originally covered in dingy reddish orange velvet but it’s carvings and lines were amazing and so it came home with me. It took a little work to get it done but it was re- upholstered in the beautiful bold red and white check and I love how it turned out. Most of my house has quieter colors on the walls and furniture but I love that the warm colors in this room make it feel warm and cozy even when it’s chilly out! I hope you have enjoyed a little peek into my favorite room today! Thank you so much for asking me to share Kim!! 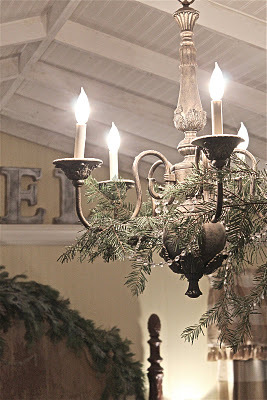 If y'all are not familiar with Courtney's blog, French Country Cottage, you are in for a treat. Get comfy and be prepared to visit for quite some time. I am also thrilled to pieces to have my home featured over at Southern Hospitality. Thanks, Rhoda and welcome to any new readers coming over from Rhoda's! Y'all have a fabulous weekend. We have Mr. Savvy's annual family Christmas to attend on Saturday. Always good to catch up with the family and there will be lots of good down home country cookin. If you have missed any of the other guest blogger's favorite rooms you can view them here. Courtney's room is so beautiful! LOVE that red checked settee! Congratulations Kim for being featured at Southern Hospitality! I adore those checks! What a gorgeous room to wake up in each morning! Beautiful room Courtney...it has always been one of my favs. Congrats Kim on your feature over at Rhoda's! Congratulations on the wonderful feature over at Rhoda's! You are amazing. And Courtney's room? Seriously? 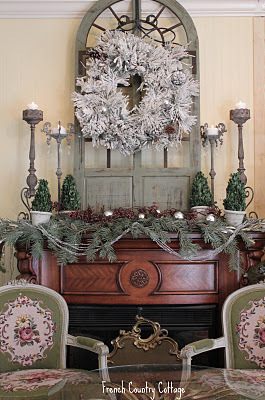 I love that mantel! And she is truly one of the nicest people in blogland! Courtney's home is gorgeous. I especially enjoy all the seasonal changes she makes on her mantels. Oh my gosh, I love Courtney's room! Especially love the last picture of it all decked out for Christmas! That ceiling too. wow. And the red checked settee - I want one too! Everything is just stunning! That room is stunning. STUNNING! 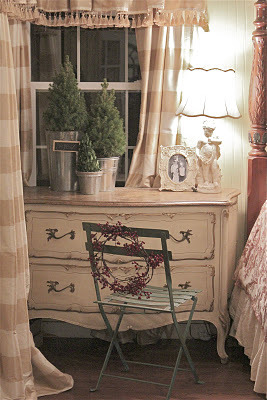 I have checked out the French Country Cottage before and really enjoy Courtney's blog. So glad to have seen it here too! Oh my gosh! I just posted your bedroom on my blog. I got it on Pinterest. I just put your blog in my favorites. You have exquisite taste!!! I just love your bedroom, Courtney! I think it was the first thing I saw that brought me to your blog originally. Love everything about it! Thanks for sharing Courtney's favorite room with us, Kim. A truly beautiful room... the ceiling is gorgeous. It does blend so well with the rest of the house. I love, love, love the red settee! What a gorgeous room. I think the red checked settee really pops in this color scheme and looks so comfy. Great job on the ceiling, too. Nice series, Kim! Gorgeous! I love your style, Courtney! You have the perfect home to make cozy. Hey, I nearly "met" you in Roseville a few months back. Betsy and you were talking when I walked up and she asked, as you walked away, if I had ever met you. Maybe next time. Happy Holidays and thank you to Kim for sharing you with us. That is a beautiful bedroom. Love the checks. Amazing! please copy this room at my house. I already have a similar four poster bed and the french chest - but not the settee - and no room for it I fear...unless we turned the bed around and moved the dresser..uh oh! What a beautiful bedroom....nice and cozy! Great C.L. find.....love the fabric she recovered it in. Thanks for sharing Kim and Courtney. What a great post! We re-did a house once that was 112 years old..a farmhouse as my husbands grandmother liked to call it! I so understand about keeping it in line with the original! Love your red checked sofa! Kim, thanks for featuring Courtney's favorite room. What a wonderful space! I could be very happy in a master like this one. Love the big open space with the beamed peaked ceiling. And that settee at the end of her beautiful bed is making my heart sing. This is one of my all time favorite rooms that you've featured. It even has a Christmas tree! Courtney is such a super sweetheart. 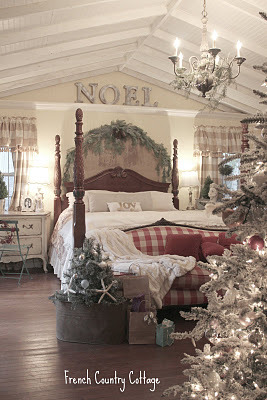 She takes gorgeous pictures.. and has the prettiest Christmas bedroom in all of blogland! Thanks for sharing your luvly bedroom Courtney.Totally droolable!!! Glad you added this to your 'favourite room 'series Debbie. Your bedroom is so beautiful. Too have the space for not only one tree but 2 that I see. And then I see 3 others on the side table. I could have a vacation in this room. Have a blessed Christmas. Such a pretty room! I am head over heels for that settee. Courtney's bedroom dressed for Christmas is one of my all-time favorite photos! Makes me want a red-checked sofa! Hope you and Doug have a fabulous time at his family's gathering today! I love this room Kim, so beautiful. I LOVE that Settee. The chandelier is gorgeous too. Love the holiday touches. Courtney's decor is always over the top....love,love,love that bedroom! What a seriously gorgeous room and congratulations on your feature, Kim. That Christmas bedroom..... completely awesome. Very charming room! Thank you all for sharing. Kim, Courtney's room is so beautiful and the fabrics are just so lovely. Thanks Kim I love this series. Every week it's a different room and different style and all inspiring. Courtney and Kim, I'm back for another look tonight for Kim's Top 10 post. I'm still in love with that red and white French love seat.